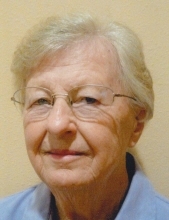 Roberta J. Kruckenberg, age 79 of Lowden, passed away on Sunday March 31, 2019 at the Clarence Nursing Home. Funeral services will be held on Friday April 5, 2019 at 10:30 am at Trinity Lutheran Church in Lowden with Reverend Daniel Redhage officiating. Burial will follow in Trinity Lutheran Cemetery. Visitation will be from 4-7 on Thursday April 4 at Chapman Funeral Home in Clarence. Roberta was born in Lowden, Iowa on August 2, 1939, the second youngest of seven children of Paul and Selma (Licht) Kruckenberg. Roberta was baptized into the Christian faith on August 27, 1939 and confirmed at Trinity Lutheran Church on March 29, 1953, where she was a lifelong member. She taught Sunday School and sang in the choir for many years and served on the finance committee. She was also a long time active member of the ladies aid. Roberta attended Trinity Lutheran School for 8 years and graduated from Lowden High School in 1957. She lived on the family farm with brothers Merlon and Robert until moving to a new home in Lowden in late 2014. She was an excellent cook and homemaker and always had a large vegetable and flower garden. Her colorful flowers around the house and farm place were always a beautiful attraction. For several years she also worked at the nearby Lincolnway Flower Farm. She always remembered all the family birthdays with cards and also a small monetary gift to the younger nieces and nephews and was always interested in their activities. She enjoyed traveling occasionally, especially to Branson and on mystery trips. Her travels also included trips with friends to Germany and Austria and the American Southwest. Roberta was also an avid Iowa Hawkeye basketball fan. Roberta is survived by brothers Merlon, Norbert, and twin brother Robert all of Lowden, George of West Des Moines; and sister Lorna (Waldemar) Bergdolt of Perryville, MO. She is also survived by 10 nieces and nephews and 18 great nieces and nephews. She was preceded in death by her parents, sister Leanne and Leanne’s husband Leonard Sellnau, and Bonnie, wife of brother Norbert. Memorials in her name may be directed to Trinity Lutheran Church, Lowden. To plant a tree in memory of Roberta J. Kruckenberg, please visit our Tribute Store. "Email Address" would like to share the life celebration of Roberta J. Kruckenberg. Click on the "link" to go to share a favorite memory or leave a condolence message for the family.